I don’t remember when I discovered shrimp and grits, but given that I thoroughly enjoy both primary ingredients it’s no wonder that it’s a dish I seek out when I’m in the low country (Savannah to Charleston). Earlier this spring I had a “girl’s weekend” in the low country (Beaufort) and sampled shrimp and grits at every chance. Some variations I liked better than others; this recipe reflects my favorite “traditional” ingredients and includes a non-traditional one as well. As I am a southerner, I experiment with a sense of origin! Shrimp and grits was once a simple breakfast staple of low country fishermen during shrimp season (May-December). The dish went upscale in 1985 after Craig Claiborne discovered it at Crook’s Corner restaurant in Chapel Hill. You may not know that a Frenchman established a colony in the low country in 1562; some form of grits (ground corn) has been around since Native Americans greeted the first white men with “rockahominie” (hominy). Acknowledging the importance of grits to the state’s culture, South Carolina named grits an official state food in 1976. Stir the grits into a bowl of cold water and allow to settle. Corn hulls may float to the surface; if so, skim off the hulls. Drain the grits. Once the grits thicken (about 5-10 minutes), reduce heat to a simmer, cover, and cook until liquid is absorbed (about 20 minutes); be sure to stir/whisk about every 5 minutes. Add stock or water if the grits get too thick too soon. Remove from heat; stir a dash of heavy cream. Taste, then add more butter, heavy cream, or salt/pepper if desired. Stir in cheese to taste. Cover and set aside. Note: this grits recipe is also wonderful as a breakfast accompaniment (to eggs and bacon, of course) and works well as a leftover (unlike “plain” grits). 1 pound shrimp—peeled, de-veined (tails on or off – traditional is on); buy “large” shrimp (21-35/pound) not prawns! In a heavy frying pan, saute onions until clear, vegetables until tender. (I used lime-infused grape seed oil.) Add garlic, cook. Add diced tomatoes; cook 5 minutes. Add roux to thicken, simmer ~15 minutes. Toss the partially-cooked shrimp, cayenne pepper and cajun seasoning into the gravy mixture; cook another 2-4 minutes. Put the spices in the frying pan with the shrimp; note that you will have junk on the bottom of the pan as a result! Fry a half pound of thick bacon; drain most of the fat but leave the crunchy bits. Use this as the base (and pan) to stir fry the shrimp. Chop (I use kitchen scissors) the bacon into medium-sized pieces and add to the mixture. Spoon grits into warmed serving bowls. Add shrimp mixture and desired toppings. Eat immediately! Roux is a mixture of flour and fat; the longer you cook it, the darker the roux. A blond roux will only take four or five minutes; a dark roux up to 20 or 25 minutes at high heat; you must stir constantly to avoid burning. If you see black specks in your roux, toss it and start over. Refrigerated roux will keep for up to two months and can be added directly to soups or sauces for quick thickening. ** There are tons of shrimp and grits recipes. This one borrows from Paula Dean and Pat Conroy as well as http://www.ezrapoundcake.com/archives/4656. 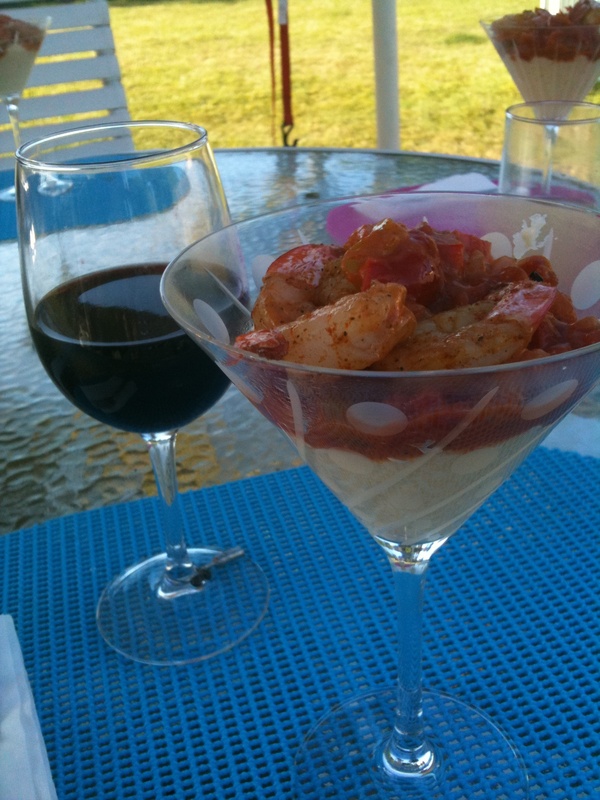 If you try this and like it, consider Nathalie Dupree’s Shrimp and Grits cookbook (Amazon).